Today is my blog anniversary or my "blogiversary". I've had the blog for 3 years now. I originally intended it to be place where I would post photos of the munchkins and news for our family that live away from us. It has evolved into so much more for me. Although lately I don't seem to have the time to update as much as I'd like, the blog is always a thought in my day. I hope this winter to post more often, especially more personal, family centered items once I'm done with all my fall photo editing. This has become a showcase not only of our lives, but for my photography, a place for me to share my passion. I want to thank all my family and friends who visit this blog and give me a reason to keep it updated and were the inspiration for this in the first place. And, to honor the photography aspect of the site, I'm offering all the presets I have released before, as well as a new set. I get lots of traffic to my blog for the LightRoom Presets I offer, so I thought it was appropriate to release my favorites.The new set has 3 of my favorite presets, though I use DramaBaby2 more then the others by far. Click Here to download the Blogiversary set. To see the post and previews for my previous sets, CLICK HERE. 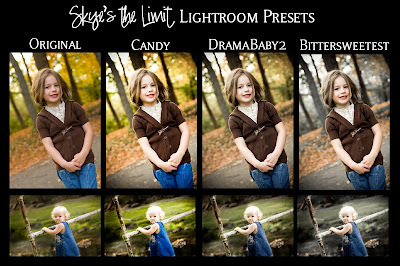 Leave me a comment and let me know which presets is your favorite! Happy blogiversary!! And thanks so much for all the presets, I had missed a few of the earlier sets so I'm excited to be able to get them all now! Thanks so much, Skye! These are awesome!! Thanks so much for sharing! I look forward to using them. Happy Blogoversary! Thank you for the lightroom share! You are an incredible photographer and I am happy to have found your blog. Oh, crud......here I just found your blog and your awesome presets, and the links have expired. I'm adding you to my list of daily blog reads. Very beautiful presets you have and I really appreciate how you're giving them away. I was trying to download all of them but they're all expired. Is it possible to email them to me? send me my email adress! Hello, I just recently started using Lightroom and I really love your photos and blog. I would love to download your Blogiversary presets but the link has expired. Is there any other way I could download them.